Halfway through our six-hour hike to the Rainbow Valley, I realized we had not seen a soul. This was just one of the perks of our family’s recent trip to the Atacama, the remote desert in Northern Chile, with incredibly beautiful, awe inspiring vistas at every turn. The stark desert landscape is a backdrop for constantly changing shows of extraordinary light and colors. This is an active, adventurous vacation filled with hiking, biking and horseback riding through gorges, canyons, dunes and salt flats--an otherworldly experience suitable for all levels of fitness, and perfect for couples, families, or solo travelers. I believe five days is ideal to properly explore the Atacama and experience different types of excursions, allowing for time to properly acclimate to the environment. To adjust to the altitude it’s best to eat light and go easy on the alcohol on your first day or two. Hard advice as Tierra did make the best Pisco Sours we had in Chile—try one with the local herb Rica Rica, known to be good for your digestion. Leave your raincoat at home, but bring plenty of sunscreen. This is the desert; ninety percent of the year it’s dry and sunny. Don’t forget to pack a hiking hat and sunglasses! Make sure to bring layers! Mornings and evenings tend to be cooler, while midday it can get very hot in the sun. If you plan on visiting the Geysers you need a warm coat, gloves and a hat—temperatures can get very cold. The Atacama is the driest non-polar locale on the planet. I wish I had brought an ultra rich moisturizer, lip balm and even a hydrating masque. Many people combine the Atacama with a trip to Patagonia, Pucon and a stop for a day or two in Santiago. Logistics: It’s not easy to get to the Atacama. After an overnight flight to Santiago (There are direct flights from NY and Miami), you must clear customs before catching a two-hour flight to Calama. From Calama it’s approximately an hour and a half drive to the town of San Pedro de Atacama. 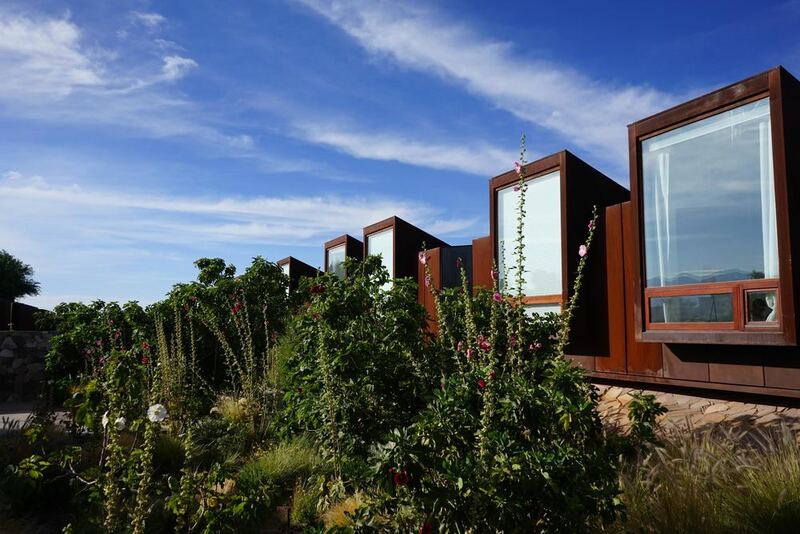 Stay: We stayed at Tierra Atacama, located five minutes outside the town of San Pedro, practically hidden behind the old adobe walls of an old cattle corral, seamlessly blending into the environment. Upon entering, the hotel opens up into a striking large great room with floor to ceiling windows that serves as both a dining and common room with gorgeous views of the Licancabur volcano off in the distant. The use of local materials in the architecture and design lend an authentic, welcoming and low- key vibe to the property. Bedrooms are airy and contemporary with indoor and outdoor showers and a private terrace patio. Service was great and always with a smile. More Options: There are other boutique hotels nearby-- the tiny Awasi, located right in town with only 8 rooms is known for its personalized attention offering all private excursions. Alto Atacama and Explora both have excellent reputations, though Explora recently had a fire and is now closed until January 2017. San Pedro has long been popular with backpackers and the town is filled with many hostels and small hotels. Excursions: We arrived tired and hungry after nearly 20 hours of travel. During lunch Max, who organizes the explorations, presented us with our many options: customizing each day to our abilities and interests, starting out with some easier activities and leaving the harder hikes at higher altitudes for the end of our trip. San Pedro is located at 8, 202 feet above sea level so you need to acclimate slowly. Excursions are limited to 8, accompanied by an English speaking guide, all who we found to be personable and well versed in the desert surroundings. 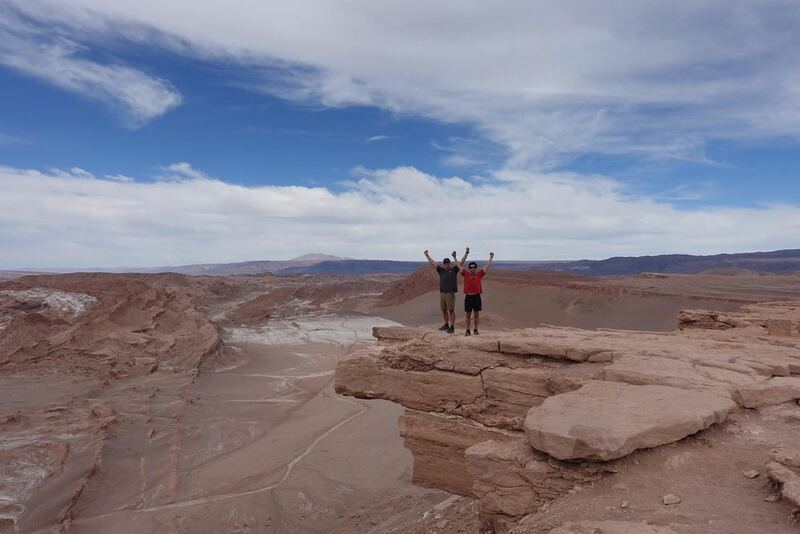 The Atacama draws an international group of travelers—we met people from Brazil, Europe, Canada and other parts of the States and became fast friends sharing the highlights or our activities around the fire pits or soaking in the hot tub. First Afternoon: After lunch we hit the ground running—one doesn’t travel all the way here to sit by the pool--heading to the Atacama salt flats to see the flamingos and making a stop in the village of Toconao to view the white, volcanic stone church and wander the sleepy streets and main village square. Then it was time for wine and cheese, set up on a picnic table in a dreamy spot with 360-degree panoramic views. After the past few hours we were friendly with our fellow van passengers, a family of three from Geneva, and we all chatted and snapped photos while watching the most spectacular sunset. With the sky still on fire, we returned to Tierra for dinner already convinced the long travel had been worth it. Wine and Dine: As with most of the hotels in Atacama, everything is inclusive at Tierra: all your activities plus food and drinks, with a full wine bar in the evenings. (I lost track of how many Pisco Sours we had.) The food overall was good, not great, with some things better than others. The menu is well designed with three choices at lunch and dinner, one always a vegetarian option. (There is also an alternative menu for picky eaters with options including pasta, hamburgers, and grilled chicken or fish.) For those who want to venture out, there are many restaurants in town; Blanco and Cafe Adobe are known as the best in San Pedro. Acclimate: Keeping it easy our first morning, we ventured by van to the nearby must visit dune-peaked Moon Valley and the red-rock Death Valley. Walking across fields of metamorphic rock was surreal—were we on the Moon? Mars? Don’t blink! If your fit, I’d suggest doing this as a hike instead, descending via a huge sand dune into Death Valley. Moonstruck: If you’re lucky to be in the Atacama during a full moon don’t miss the nighttime walk. We left Tierra at 10pm and drove ten minutes or so to Death Valley. What followed: a moonlit path through the canyons, a small scramble over a hill to arrive at a campfire complete with wine, snacks and collapsible chairs on what felt like the edge of the world. It was magical and one of the highlights of our trip. Don’t be dismayed if there’s no full moon when you’re visiting—the dry desert air and the lack of development make for perfect stargazing nights. Bike: Leaving the hotel we biked bumpily through the town until we reached the open road and the very welcomed paved roads. It was an easy ride towards the Salt Mountain Range and Devil’s Canyon. After crossing the San Pedro River, we navigated our mountain bikes through the narrow canyons. This was a first for all of us, unlike other rides we have done in the past—scenic, exciting and so fun—this is a must do in Atacama. At the end of the Canyon we hiked up a small hilltop to be rewarded with expansive views. Cactus and Hot Springs: Another highlight of our trip! Here we followed Tomas through completely different scenery—a steady uphill climb through a valley lined with giant cactuses and scattered with igneous rocks. After a few hours we arrived at the Puritama Thermal Springs, eight pools of warm, mineral water known to have many health benefits. A quick change into our suits (there’s dressing rooms and bathrooms available) and we weaved our way through the wooden walkways in and out of the various pools soaking up the minerals and relishing the scenery. Wander: The dusty adobe town of San Pedro is sleepy no more; in the last ten years the population has exploded due to the increase in tourism. Stroll the main pedestrian only street of Caracoles where the shops sell inexpensive handcrafted wool sweaters, hats and mittens that make great presents to bring home. Quiet during the day, nighttime is lively with the many bars and restaurants buzzing with people. Relax: After a day of biking and or hiking you’ll welcome an afternoon massage in the Uma spa complete with an outdoor swimming pool, Jacuzzi, steam room and a small indoor heated pool with water jets and reclining in pool chairs.